Identification. The place name "Singapore" is derived from Singa-pura ("City of the Lion"), a commonly used term since the fourteenth century. The main cultural traditions are Malay, Indian, Chinese, and to some extent Western (British). The different communities do not regard themselves as sharing a culture; instead, they consider themselves parts of a whole. This is illustrated by reference to a popular local dish, Rojak , a salad in which the various ingredients are covered by the same peanut sauce, forming a distinct whole with each ingredient clearly discernible. The peanut sauce is Singaporeanness; the other ingredients are the different cultural traditions. Location and Geography. 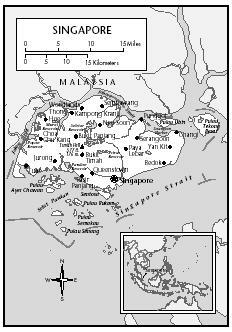 Singapore lies at the tip of the Malay peninsula. It borders Malaysia, Indonesia, and Brunei. Its area is 248 square miles (642 square kilometers), including the main island and some sixty islets. The main island is flat with a hilly region in the middle. The highest point is Bukit Timah, feet (206 meters) above sea level. The climate is tropical with high humidity and abundant rainfall, especially during the northeast monsoon in December to March. The period of the southwest monsoon (June to September) is usually the driest. The main island is fully urbanized with a dense commercial city center to the south. Around the city center are new townships that house about 86 percent of the population. The townships are self-contained and have high-rise apartment blocks, shops, medical and social service buildings, religious buildings, and schools; they are well connected by the Mass Rapid Transport System (MRT), which circles the island. Demography. Singapore has a population of about three million, 2.7 million of whom are citizens and permanent residents. The other three hundred thousand are mainly foreign workers. The Chinese constitute about 78 percent, the Malays 14 percent, the Indians 7 percent, and others 1 percent of the population. The ethnic composition of the population has been relatively stable. Linguistic Affiliation. Singapore is a multilingual state. The national language is Malay, and the four official languages are Malay, English, Indian (Tamil), and Chinese (Mandarin). English is the administrative language and the medium of instruction in schools. Pupils also choose one of the "mother tongues": Malay, Tamil, and Chinese. There are various subdialects of the different languages. Symbolism. Economic prosperity and political stability are associated with the national culture, as is the Singaporean concept kiasu . Kiasu means "afraid to lose" and refers to the wish to come in first in lines, competitions, negotiations, and so forth. Some say kiasu keeps standards high, but others claim it leads to a graceless society. The flag is divided into equal red and white horizontal sections symbolizing unity and purity. A white crescent moon and five stars in a circle symbolize a growing nation and the ideals of democracy, peace, progress, justice, and equality. The national anthem and national motto are in Malay. Other symbols draw on the distinct ethnic traditions. Chinese, Malays, and Indians draw on symbolic materials and ritual practices from their own traditions and for their own purposes. came into being as a British trade port in 1819 and continued as one of the three British "Strait Settlements." In that period, Malays from nearby areas, large numbers of immigrants from China, and later Indian convict laborers moved into the island. The British did little to integrate the population, largely leaving each community to itself. Singapore gained independence in 1959 and joined the Union of Malaya in 1963 but was expelled in 1965. The next five years were marked by the "policy of survival." From 1945 until the early 1970s, the island had severe housing shortages and a poor infrastructure, high criminality and unemployment, racial riots, and communist uprisings. The "survival policy" was based on the attraction of foreign investment through low taxes, the development of an efficient infrastructure, a disciplined workforce, and strict political control. 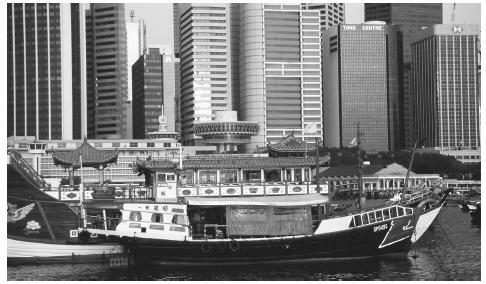 In thirty years Singapore changed from a rough trading port to a rich, orderly, industrialized society. The remembrance of social and economic difficulties influenced the development of a national culture with a focus on wealth and stability and the idea of multiculturalism. National Identity. There is no single dominant national identity. Instead, there are complex identities that draw on a variety of sources and are relevant in different situations, although ethnic identity takes precedence in most situations. Ethnic Relations. Cultural links to India, China, Malaysia, and Indonesia give Singaporeans orientations and loyalties that stretch far beyond the national borders. These differences are superseded by an identification with Singapore as a homeland with wealth and stability. Distance and distinction mark ethnic relations within the country. Singapore is a green city, but it has a very groomed greenness. There are two small national parks. Only at the fringes of the island and on the islets is there rural life, and it is disappearing fast. Highways crisscrossing the island, the huge port on the southern tip, vast industrial areas to the west, and the airport to the east create an air of swift efficiency. The most striking features of the landscape are the high-rise buildings. This is a distinctly modern architecture with roots in the functionalism of the 1960s. In the 1980s and 1990s, there was more diversity in building styles. The typical domicile is a small apartment off the ground. Ethnicity is not an issue in the public use of space; communal differences are clearly discernible in the layout of the interiors of homes and certain town areas. Food in Daily Life. Rice, fish, chicken, and vegetables are the staples. When these ingredients are mixed with a rich variety of spices, chilis, coconuts, lime, and tamarind, the variations are endless. Food is often eaten outside the home in food centers where food is cheap, tasty, and freshly made. There are many cafés, coffeehouses and teahouses, and formal restaurants. Forks and spoons are used, but Chinese food is eaten with chopsticks, and Indian and Malay food may be eaten with the hand. The three main meals are breakfast, lunch, and dinner. Most meals are eaten hot. Malays do not eat pork, Indians do not eat beef, and many Buddhist Chinese are part-time vegetarians. Many people do not drink alcohol. Food Customs at Ceremonial Occasions. Special dishes are eaten during the major ceremonial occasions of all three ethnic groups, but none are connected to national celebrations. Basic Economy. Singapore has a fully developed industrial international economy. The country depends heavily on imports, as there are few natural resources on the island. There has been a consistent surplus in the overall balance of payments. There is a large degree of state control of the economy. Land Tenure and Property. There is a large degree of private ownership of houses and apartments. Land tenure is firmly regulated by the government and there are government plans for the use of every inch of the island's territory. Foreigners usually are allowed only to lease land, but they may buy apartments. Commercial Activities, Major Industries, and Trade. Manufacturing is the most important economic sector, followed by financial and business services, commerce, transportation, and communications. Production is mainly for export. The main exports are electronics, refined petroleum products, natural rubber, and palm oil. The main trading partners are Malaysia, the European Union (EU), the United States, Hong Kong, and Japan. Division of Labor. About two-thirds of the resident population is employed. Only 0.2 percent of the members of the workforce are employed in the primary sector, and about 37 percent of employed persons work in commerce and finance and the business sector. Twenty-three percent work in manufacturing, 21 percent in other services, and 18 percent in transportation and communications and construction. The unemployment rate has long been below 3 percent but increased during the recent economic downturn. Chinese are over-represented in professional, technical, administrative, and managerial jobs, whereas Malays are the most underrepresented in highly skilled jobs, with Indians in the middle. The substantial numbers of foreign workers are overrepresented in production and related work. Classes and Castes. There are wide income and wealth differences, but the country is more differentiated by ethnicity than by class. All the ethnic groups have experienced upward occupational mobility. There is an intense focus on education. Good marks are a sure path to good positions with good wages. In this respect, Singapore is a meritocracy. Shutters open out onto clotheslines in downtown colonial-style housing in Singapore. Symbols of Social Stratification. Singaporeans jokingly refer to their desire for the "five C's": car, condominium, credit card, club membership, and career. These are important symbols of wealth and status regardless of ethnicity. There is no national costume, but the orchid is used as a national symbol, and textiles with orchid patterns may be employed as a national symbol on formal occasions. Boats and buildings in Inner Harbor. High-rises are a striking feature of Singapore's landscape. Government. Singapore is a republic with a parliamentary system. The head of state is the president, who is elected for a fixed term of six years. The parliament is elected in a general compulsory election every five years. There are also six nominated members of the parliament. The cabinet is the executive organ of the state, and execution of government policies is carried out by ministries and statutory boards. Leadership and Political Officials. The People's Action Party (PAP) has maintained a large majority in the parliament since 1965, with only a few seats held by politicians from opposition parties. The road to a political position through the cadre system of the PAP lies in educational and professional merit as well as loyalty. The other parties are led by politicians with strong personalities. Social Problems and Control. The crime rate is low. The judiciary system is based on the British legal system. The death penalty is imposed for drug smuggling, and caning is still used as a punishment. In addition, there are fines or other penalties for a wide range of transgressions, such as throwing litter on the floor, urinating in the elevator, and engaging in politics outside registered political parties. Military Activity. Both military and civil defense are well developed, and the armed forces are equipped. Two and a half years of compulsory military service are required for males. Social welfare is financed through the Central Provident Fund (CPF), a public savings scheme. Employees under age 55 and their employers contribute a fixed amount of a worker's salary into an individual account administered by the CPF. This account provides financial security for old age and can be drawn on for housing and medical and educational costs. Charity is an important aspect of the financing of social welfare. Care of the old, sick, and disabled is in the hands of families and relatives. Three different agencies provide some social services for members of the three ethnic groups. Independent social work units also carry out some social work. 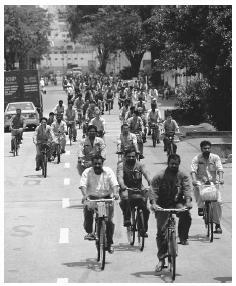 Workers riding bicycles to Sembahong Shipyard, one of the two repair facilities in Singapore. Cars are a symbol of wealth and status. nongovernmental organizations (NGOs) in a strict sense, but they form the basis of the civil society. A pattern of division according to ethnic distinction exists, but there are many nonethnic associations and societies. Nearly 80 percent of men and about 50 percent of women are employed. Women have joined the workforce in large numbers but are underrepresented in leadership positions in all areas and institutions. Marriage. Polygamy is allowed among Muslim Malays, but otherwise monogamy is the rule. Interethnic marriages are not common. Divorce is becoming more common. The average age at first marriage has increased, and it is customary for young people to live with their parents until they marry. Domestic Unit. The basic household unit is the nuclear family, which constituted 85 percent of resident households in 1990. Close links with relatives on both the husband's and the wife's sides are usually maintained. The proportion of households without a family nucleus shrank from 26 percent in 1957 to 8 percent in 1980, reflecting the changes from an immigrant to a settled population. Males dominate as heads of households. Inheritance. Traditionally, sons inherited family assets, while daughters were expected to marry out of the family. This pattern is less common today. Kin Groups. Kin groups play a significant role in all ethnic groups, and people often move within wide networks of relatives. Privately, kin groups are important, but politically and economically, they play a marginal role. Infant Care. Children are brought along in most situations except business and very formal events. Small children are showered with affection. Generally, children are expected to be quiet and obedient and may be physically punished for misbehaving. There is very little free space where children can play and few areas designed specially for children. Child Rearing and Education. Children are thought to hold the key not only to their own future but also to the future of their families, and education is regarded as extremely important. There is a range of private and public nurseries, kindergartens, and play schools. Children start school at age six. Higher Education. There is a great emphasis on higher education. Children spend six years in primary school and four years in secondary school and then go on to a vocational school or university, depending on their grades (a sure way to higher education in Singapore) or money (a university education abroad). Competition for entrance to the best schools is fierce. Older people ideally are treated with respect, but wealth and status may supersede age distinctions. A social superior or an authority is treated with much formality. There are great differences between formal and informal events, situations, and places. In social interaction, a certain physical distance is kept, especially between men and women. Food rules of the ethnic groups are always respected. Religious Beliefs. There is freedom of religion with some exceptions. Singapore has been described as one of the most religious countries in the world. The major religions are Islam (Malay), Hinduism (Indians), Buddhism, Taoism, and folk religion (Chinese), along with a substantial number of Christians of various denominations. Religious Practitioners. Religious experts vary from formally installed priests and teachers representing the institutionalized religions to self-ordained shamans, healers, and sorcerers. Death and the Afterlife. A funeral is a major ritual for all ethnic group. The idea of an afterlife is generally shared. A well-developed modern medical system consists of private and public clinics and hospitals. Traditional medical beliefs and practices are also common. The national holiday is on 31 August and is celebrated with military parades and culture shows at the national stadium. The ethnic public holidays are divided nearly equally among Chinese, Malay, Indian, and Christian holidays. The most important ethnic holidays are the Chinese New Year and the Malay Muslim Rahmadan, both celebrated in January–February, and the Indian Deepavali or Festival of the Light, celebrated around September–October. Literature, Graphic Arts, and Performance Arts. A common complaint is that Singapore has no culture, and the fine arts have a limited public. The government subsidizes some art institutions and events, but generally there is little public funding. The different ethnic groups have their own artistic traditions and focus on arts. The contemporary generation is more focused on contemporary art forms. Singapore has well-developed scientific institutions. Priority is given to technology and applied science. There are two universities: the National University of Singapore, a full-scale university with all disciplines, and the Nanyang Technical University. Bloodworth, Dennis. The Tiger and the Trojan Horse , 1986. Brazil, David. Street Smart Singapore , 1991. Census of Population , Monograph No. 5. Singapore, 1990. Cheng, Lim Keak. Geographical Analysis of the Singapore Population , 1995. Chua, Beng Huat. Political Legitimacy and Housing. Stake-holding in Singapore , 1997. Clammer, John. The Sociology of Singapore Religion: Studies in Christianity and Chinese Culture , 1991. Craig, JoAnn. Culture Shock: Singapore and Malaysia , 1979. Drysdale, John. Singapore: Struggle for Success , 1984. Hill, Michael, and Kwee Fee Lian. The Politics of Nation Building and Citizenship in Singapore , 1995. Ho, Kong Chong, and Chua Beng Huat. Cultural, Social and Leisure Activities in Singapore , 1995. Huff, W. G. The Economic Growth of Singapore: Trade and Development in the Twentieth Century , 1994. Kuo, Eddie C. Y., and Tong Chee Kiong. Religion in Singapore , 1995. Lai, Ah Eng. Meanings of Multiethnicity: A Case-Study of Ethnicity and Ethnic Relations in Singapore , 2nd ed., 1995. Lee, Edwin. "Community, Family and Household." In Chew C. T. Ernest and Edwin Lee, eds., A History of Singapore , 2nd ed., 1996. Lim, Catherine. Little Ironies: Stories of Singapore , 1978. Pugalenthi Sr. Elections in Singapore , 1996. Tamney, Joseph B. The Struggle over Singapore's Soul: Western Modernization and Asian Culture , 1995. Toh, Mun Heng, and Tay Boon Nga. Households and Housing in Singapore , 1995. Turnbull, C. M. A History of Singapore, 1819–1988 , 1989. Yeoh, B. S. A., and L. Kong, eds. Portraits of Places. History, Community and Identity in Singapore , 1995. I would like some information on some traditional, cultural costumes/clothes that are worn in Singapore. The Malays are the indigenous ethnic group of Singapore and not mere immigrants as suggested by this article. While many Malays have ancestors who came from other parts of the Malay archipelago, Singapore does have a native ethnic Malay community. And the Muslim fasting month of Ramadan is not in January-February, at least not every year. The starts and ends of Ramadan varies from year to year, always about 11 days earlier than the previous year. The official Muslim holidays in Singapore are Eid Al-Fitri, celebrated after Ramadan, and Eid Al-Adha. Other important, but unofficial, Muslim religious events include the Maulud, celebrating the Prophet Muhammad's birthday. Also, not all the Muslims in Singapore are Malays with a sizable being Indians. The Arab community is also Muslim and some Eurasians are also Muslims. About the segment about Inheritance, what this article said about only sons inheriting is not practice by the Muslim community, which follows the faraid or Islamic inheritance laws where daughters do have inheritance rights. Also, intermarriage is especially common among Muslims. Malay-Indian intermarriages are very common. Our National Day is on the 9th of August, NOT 31st! some of the information needs to be reviewed over again & the comments posted by the other users definitely needs to seriously considered. And for those asking for our national dress - we don't have one - but anything with an ORCHID print is what we use to represent Singapore! Men wear batik shirts with orchid prints. Women wear anything - skirts, blouses, shirts etc - with orchid prints! Or you can use our colours - red and white - to represent singapore! WE don't have a national dress, cos we are an amalgamation of so many races, so the "orchid" is our symbol in terms of dress! I would like to hear more about the geography and the physical features of Singapore. I thought our national clothes is the Singapore Airlines uniform? ..i want to know more about the lifestyles in singapore,e.g,why singaporeans like to queue and walk very fast and also love to use mobile phones a lot? what are the mainly concept tradition in singapore? Visisted Singapore cemeteries en found a plant on almost every Muslim tomb and cannot find information on this custom and the the type of plant. Can someone help me out? THANKS FOR SHARING THIS INFORMATION TO EVERYONE,ESPECIALLY TO LIKE ME WHO WANTS TO KNOW YOUR CULTURE,TRADITION AND BELIEFS. IT'S A GREAT HELP FOR ME. GOD BLESS!!! how many meals do singaporean people eat in one day? What is the main meal? who sits at the head of the table and is there a certain way that food is served? A certain order? What fods are usually eaten adn how are they prepared? Are there any factors that affect food supply and distribution? singaporean commonly eat 3 meals but depending on lifestyle it may range from 1 to 3. I consider main meal to be lunch. As far as I know, there is no specific seatings during dining and due to fast pace lifestyle in Singapore it is common that family doesn't dine together often. Rice is the main staple food. All i have gone through concerning SINGAPORE revealed to me that this is a stable country that is good for people that have a fear of God at heart. In fact, i love to be in this country to contribute my own as a foreigner. If i can receive help from you to have a stay there to promote moral values in accordance with religious practices in the way that will bring people closer to their creator. I want to be there with you, i love this country. Thanks sincerely for giving me this opportunity. Best regards. What's the national costume of the singapore?!? I ned to now! im representing the singapore in the UN pageant. I am doing a project so I need information about the traditional costumes in Singapore and Chinese,Malay and Indian food that can found in Singapore. I have a report about what is the attitude of the Singaporians towards their problems!! I am 11 and I lived in singapore for 2 years and I am now in us, ohio. sow I am doing this theam on my project. The national costume for ladies in singapore is the kebaya. i want to be sure that,what is the culture and beliefs of the Singaporean as in general? thank you.. The national day for Singapore is on the 9th of August not the 31st. The 31st of August is actually the festival of the hungry ghosts!!! Thank you for writing this and organizing it so simply. I'm doing a project in culture of Singapore for my Human Geography class and this article and the comments were really, very helpful. Thanks again! Thanks for the information guys, I appreciate it. I'm going to need this information for my upcoming general test. Thanks for all the help. I would like to know more about their traditions, culture, values and beliefs.. Thanks for this info.. this will be one of my references as i about to report tomorrow in my master's study about the place of Singapore.. This is a great article, however i would like to know more about their policies. This article was very helpful for me. It helped me get my information for my social studies project for Singapore. May I know if there are Catholics there who performed their Sunday obligations ,or are there Catholic Churches around in the country? or are their priests or Nuns who are Catholic or are there Catholic Schools. Maraming Salamat po. similarities and differences between Singapore and Australia? I do enjoy this article. I have stopped by Singapore with my family and it was very nice there. I wish this page would tell me how people in different classes lived in Singapore including the rich, middle, and poor classes.